Youngest of nine children born to Nicolas Chapdelaine and Madeleine Dodeman. Following grammar school, Auguste dropped out to work on the family farm. He early felt a call to the priesthood, but his family opposed it, needing his help on the farm. However, the sudden death of two of his brothers caused them to re-think forcing him to ignore his life’s vocation, and they finally approved. He entered the minor seminary at Mortain on 1 October 1834, studying with boys half his age. It led to his being nicknamed Papa Chapdelaine, which stuck with him the rest of his life. Ordained on 10 June 1843 at age 29. Associate pastor from 1844 to 1851. He finally obtained permission from his bishop to enter the foreign missions, and was accepted by French Foreign Missions; he was two years past their age limit, but his zeal for the missions made them approve him anyway. He stayed long enough to say a final Mass, bury his sister, and say good-bye to his family, warning them that he would never see them again. Left Paris, France for the Chinese missions on 30 April 1852, landing in Singapore on 5 September 1852. Daughter of Andrew de'Botti, a merchant. Villana was a pious child, and at age 13 ran away from home to join a convent. She was refused and had to return home. Soon after, her family married her to Rosso di Piero. The rejection at the convent and the marriage seemed to change Villana. She suddenly became lazy and worldly, concerned only with pleasure. One day as she was getting dressed for some type of entertainment, her reflection in all her mirrors suddenly changed to a demon. Villana understood this to be a reflection of her sin-laden soul. She tore off her clothes, put on something poor and simple, and ran to the Dominican Fathers of Santa Maria Novella for help. She became a Dominican tertiary, concentrated on her vocation of married life, and spent her free time praying and reading Scripture and the lives of the saints. Her desire to atone for her earlier life sometimes overwhelmed her, and her husband and family had to stop her begging door to door and doing other penances. She was given to religious ecstasies at Mass, but became the object of much ridicule and slander. Her health suffered, but she received visions of Our Lady and the saints, and had the gift of prophecy. Even her fiercest opponents eventually came to see her as a living saint. Born to a poor, rural family, he had limited schooling and had to work from an early age. Joined the Friars Minor Conventual in Niepokalanów, Poland on 5 March 1930, taking the name Tymoteusz and making his solemn profession on 11 February 1935. Worked in the convent infirmary, and the warehouse and shipping departments of the magazine Rycerz Niepokalanej (Knight of the Immaculate) with its founder Saint Maximilian Kolbe. At one point Brother Tymoteusz tried to go to the foreign missions, but gave it up when the Nazis invaded Poland to start World War II. Arrested with six of his brother friars in October 1941 by the Gestapo, and sentenced for forced labour at the Auschwitz death camp for the crime of being Catholic. Ministered to his fellow prisoners in his remaining few months. Martyr. Deacon. Trusted aide to Pope Saint Leo the Great. Papal legate. Sent to “Robber Synod” at Ephesus in 449 to report on the Monophysitism heresies of Eutyches, which denied the humanity of Christ and claimed that He had only a divine nature, a teaching condemned in 451 by the Council of Chalcedon. Eutyches' followers attacked the legate party, and forced them to return to Rome. Arch-deacon c.455. Worked on an updated method of calculating the date of Easter. Chosen 46th pope in 461. As pope, Hilary confirmed the work of several general councils, rebuilt and remodeled many churches, fought Nestorianism and Arianism, and held several Councils at Rome. Renowned for defending the rights of his bishops while exhorting them to curb their excesses and devote themselves more completely to God. Helped define the Church‘s role in the empire, and affirmed the position of the pope, and not the emperor, as leader in spiritual matters. He continued Leo I‘s vigorous policy, strengthening ecclesiastical government in Gaul and Spain. Erected churches, convents, libraries, and two public baths, and his synod of 465 is the earliest Roman synod whose records are extant. Born a Gallo-Roman; brother of Saint Lupicinus. Became a monk at Lyon, France at age 35. Hermit in Condat (modern Saint-Claude) in the Jura mountains with his brother and sister; would-be students were attracted to them. Founded abbeys of Condat and Leuconne, and the convent of La Beaume (later named St-Romain-de-la-Roche), among others. Spiritual teacher of Saint Eugendus of Condat. Ordained by Saint Hilary of Arles. Healed two lepers by embracing them. Oswald’s parents came from Denmark to England before his birth. The boy was educated by his uncle, Saint Odo the Good. Priest in the diocese of Winchester, England. Benedictine monk at Fleury-sur-Loire, France. Bishop of Worcester, England in 962. Worked with Saint Dunstan and Saint Ethelwold to revive monastic and ecclesiastical discipline in England. Founded the abbey at Ramsey, and the monastery at Winchester. Archbishop of York in 972. Wrote theological treatises, and worked for the improved theological training of his clergy. Daily washed the feet of poor people. Pious woman who lived a life of extreme asceticism walled up in a small house just outside of Beroea, Syria. Bishop of Tréguier, Brittany, France. Spiritual student of Saint Comgall of Bangor. Abbot of Bangor Abbey. Potter. Martyred in the persecutions of Decius. 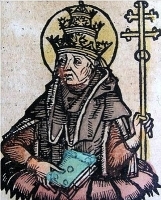 Sixth-century bishop. Llanmadog, Wales is named in his honour. Sixth century nun. Honoured in Ireland. A number of clerics and layman who died as martyrs of charity for ministering to the sick during a plague that ravaged Alexandria, Egypt in 261. 16 lay people martyred together in one of the periodic anti-Christian persecutions in imperial Japan.